Dijon is located southeast of Paris, France, less than two hours away by TGV train. The population of Dijon Itself is about 150,000 people. There are almost 250,000 people in the greater Dijon area. Dijon has one of the best preserved medieval centers in France. It is easy to walk and see the sites, with lots of pedestrian walking streets. You'll sample some of France's finest cuisine and drink great Burgundy wines at dinner or at one of the many wine bars in town. Dijon offers many cultural activities, including a wealth of museums and annual festivals to keep the tourist busy, including the L'Été Musical (Musical Summer), a classical music festival in June. Saint Benignus (Saint Bénigne) is Dijon's patron saint, and the cathedral of Saint-Benigne de Dijon has an interesting crypt to visit, which includes a small rectangular chapel in which the relics of Saint-Benigne were venerated. The crypt is believed to be one of the oldest Christian sanctuaries still visitable in France. The Dijon-Ville station just 5 minutes from the town center. High-speed TGV trains from Paris or Lille stop here. Car hire is available at the station. There are many hotels within a five-minute walk of the station. Book a Ticket to Dijon. Dijon's Palais des Ducs de Bourgogne was home to the Dukes of Burgundy, a collection of buildings dating to around 1365 and built atop a Gallo-Roman fortress. 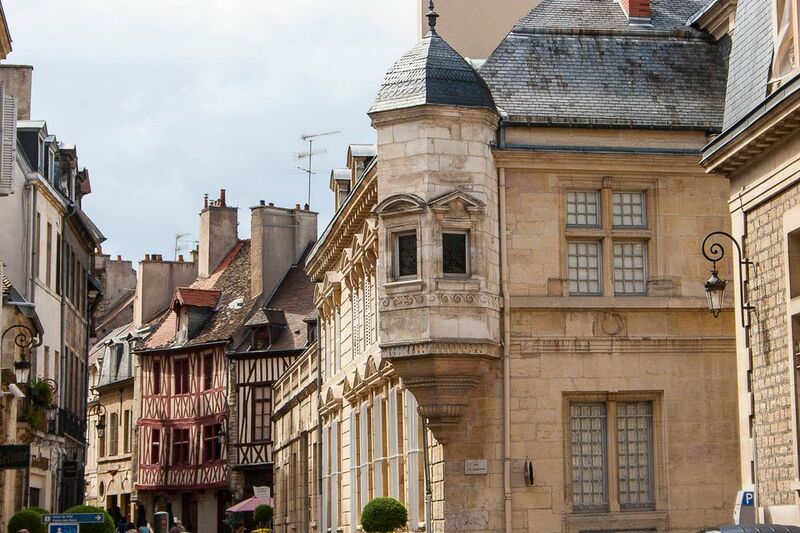 You can visit parts of the palace complex, including the Museum of Art, and the fit among you can climb the "Tour de Philippe le Bon" for an impressive view of Dijon. The wonderful Place de la Liberation is across from the palace, where you can sit in a restaurant, wine bar or cafe and view the palace or the interesting fountains, undulating shafts of water that light up at night. There are two Tourism Information points in Dijon, most useful is the Tourist Information Center in Place Darcy. The Tourist Office is found at 34 rue des Forges - BP 82296 - 21022 Dijon Cedex. In a pinch, the Dijon Tourism office can help you find accommodations, but it is usually best to reserve a hotel in advance. If you have time to stay a while and enjoy the atmosphere, a vacation rental or apartment may be more to your taste, HomeAway lists over 40 Dijon Vacation Rentals. Available in one, two and three-day versions, the Dijon Pass might save you money on museums, transportation, and tours. More: Pass Dijon Côte de Nuits. First, the kir, a mixture of white wine and cassis, was invented by one of Dijon's mayors. The food you'll see on many menus includes: snails in garlic butter, coq au vin, boeuf bourgignon, and parslied ham, all washed down with a fine Burgundy, of course. Dijon has many interesting things to see and do. If you're high tech and a bit lazy, you can take a Segway tour of Dijon (buy direct)--but Dijon's well preserved historic center is perfect for walking, and includes many pedestrian-only streets. Musee de la Vie Bourguignonne 17 rue Ste Anne shows how Burgundians lived their lives in the olden days. Musee de la Moutarde 48 quai Nicolas Rolin. The Museum of Mustard is a must for burger lovers. Cathedrale St-Benigne Rue du docteur Maret, offers the above mentioned evocative Romanesque crypt to wander through. Jardin de L'Arquebuse Ave Albert 1er, is Dijon's celebrated botanical gardens. Musee Archeologique 5 rue du docteur Maret. The archaeological museum has some interesting finds, including Celtic jewelery. Musee des Beaux-Arts in the Palais des Ducs, Place de la Liberation, has your fine art. Dijon's Covered Market was designed by Gustave Eiffel, who was born in Dijon. Many fine restaurants surround the market square.